Studies have shown that owning a pet increases happiness, lowers anxiety and stress and prevents stroke and allergy but these benefits come at a price. Even if we groom our cat regularly, we will still have to deal with a hairy house and as much as we love our pet, we hate seeing their hair everywhere: on the clothes, the carpet, the furniture and even our car seats. While removing the hair from some surfaces is relatively easy, removing the hair from clothes, for example, will give us headaches. Luckily for any cat owner, there are lots of pet hair removers that will solve the problem for a fair price. They all come in different shapes and have their own pros and cons but we’ve selected the best 10 pet hair removal products currently available. It’s a great tool for any pet owner as it cleans almost any textile surface in the house (clothing, pieces of furniture, carpets, curtains) in just three simple steps. Not only that it’s very easy to clean because of the self-cleaning base but it has an ergonomic shape which makes removing pet hair much more comfortable and seamlessly effortless. A simple roller that does exactly what it is supposed to do: it removes pet hair from any piece of furniture in the house and even in the car. 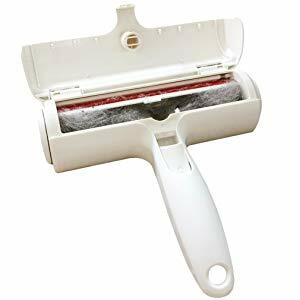 It is extremely easy to use, by just moving the roller back and forth and it will pick up any pet hair left on the surface. It is a great pet remover that can be used on sofas, couches, carpets, beds and many other textile surfaces that gathered your cat’s hair. It is a solid tool, not only for pet owners but for any person that tries to remove lint from their clothes and furniture. A classical pet hair remover that uses sticky tape to remove any unwanted hair or lint from textile surfaces. Each set contains five refills of 90 sheets each and a hair remover. 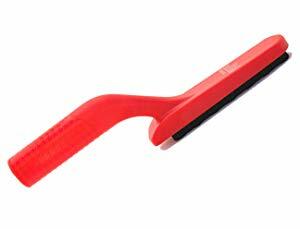 FURemover Broom is a pet hair remover that can only be used to remove pet hair from floors (carpet or hardwood floors) but its squeegee makes it usable for windows and cars as well as to clean spills on floors. It has a large coverage area of 12 inches that ensures a fast clean every time. This is another 100% reusable tool that is designed for pet owners. It does not only remove pet hair, but also lint from various pieces of furniture or clothing. It has a roller that draws the cat hair from the carpets with no difficulty, it just needs to be moved back and forth. It has an ABS body and a PP roller and nylon etiquette brush. It looks so different than the other prettier pet hair removers that at a first glance you would never guess what it is used for. This original Pet Hair Remover comes at a lower price and is a favorite for any environmentalist as it’s manufactured from 90% recycled materials. 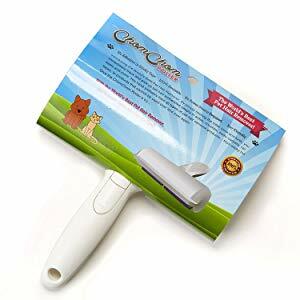 This is a unique glove-shaped pet hair remover that seems very easy to use compared to traditional tools. It is very cheap and easy to use. It is not only used to remove hair from the fabrics you have in your house but also to groom your cat in a pleasant way. A very good pet hair remover that is very similar to our first reviewed product, the uHome Pet Hair Remover. It has a reusable double-sided brush that can be used many times to remove the hair from any of the textile surfaces that may gather your cat’s hair: clothes, carpets, upholstered furniture, pillows, car seats, and linens. The package contains, besides the brush and the self-cleaning base, an additional miniaturized travel set that can be transported with ease. 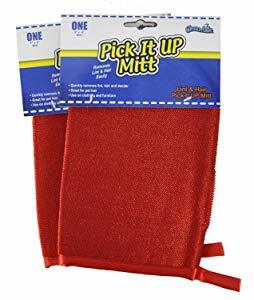 This simple mitt can be used to remove pet hair, dander and lint from any fabric or clothing quickly and easily. It has a thumb slit that makes the mitt much easier to handle when worn in the hand. It’s made of polyester and polyamide which makes it very good at picking up hair. A simple brush that can be used to quickly remove pet hair and lint from clothing, furniture, carpets, car upholstery and any other place that gathered pet hair. It is made from nylon bristles and an ergonomic, easy to use handle. It is very easy to clean in the sink with a quick rinse. As you can see, the offer is varied and while all products have their own advantages and disadvantages, chances are you won’t find the perfect tool that is good for everything and you may have to buy several products. Yes, we would love to be able to spend a lot of money on our cat but the reality is we have a budget. However, differences between the different types of products are not different enough to have such a big impact on your choice. With prices ranging from $6.49 to $39.95, the choice you make will have a great impact on the functionality. 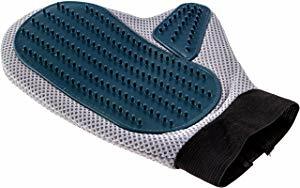 Yes, the rubber mitt is the cheapest but you won’t be able to do everything you want with it so it’s best to also consider other factors. For example, if you buy a cheaper remover you may have to buy additional sticky paper from time to time. Some products are made to last longer while others are not durable. Some constantly use consumables, like sticky sheets, while others are reusable. When it comes to durability all manufacturers will confidently claim their product will last for years but this is not always the case. When you want to know how long a product will last, you need to read what regular people say, users just like you who have nothing to gain or to lose. When you don’t have any reviews, try to find out what materials the product is made of because it has the biggest impact on the overall quality. The next factor is, of course, the brand. If you have a brand you know you can trust than go with it. A factor that has a great impact on durability is how easy that tool can be cleaned and maintained because if you can’t clean it properly you’ll probably throw it away pretty quickly. If it takes you longer to remove the hair from the tool than from the couch than what’s the point? Self-cleaning removers have an advantage and so do classic sticky tape removers. Various pet hair removers can only be used for the extracion of hair from some places, while the others are inaccessible. What are the places that are most likely to gather your cat’s hair? You will need a tool that is great for that specific surface. Most likely your cat will generously leave its hair on many different pieces of furniture, clothes, and carpets and to have the ability to remove it all and you will need to either choose the one with a complete functionality or two or more products that, when combined, will be able to have the ability of it all. Then, you need to think deeply about what exactly you want to remove from those surfaces. If it’s just your cat’s hair than almost any tool will do the trick but if you want to also be able to remove dust or lint than you should focus your attention on removers or rollers that also have this capacity. A classic pet hair roller is a good tool to remove small batches of hair in a short time. You should have one by the door in case you notice pet hair on your clothes when you go out. Another thing to consider is that classic rollers usually require you to keep buying refills and if you don’t want to do that you’ll need to choose a different product. 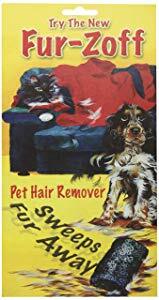 If you have a pet you will surely need a pet hair remover, there is no way around this. As most of them are pretty cheap this is not necessarily an issue. But the problem is knowing the best tool to buy and for this, you’ll need to do a lot of research but first of all, you should know what you need. Pet removers are very different: some are reusable rollers, other use sticky tape to do the job, some are just rubber gloves, specially designed for easy hair removal, while others are more complicated but also more complete in functionality. The best thing you can do is try to reduce the hair your cat will leave around the house and the best way to do that is to groom her. It is not only efficient, but you will both enjoy this time. 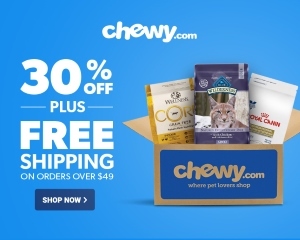 To sum up all the described amazon above of pet hair is a very small to pay for the joy and the unconditional love you get in return from your cat and if you have the right pet remover you’ll stop seeing it as a problem because you’ll have the perfect solution. You might use a broom to clean the fur from the carpet and the hardwood floors, a roller for the sofas and the clothes, and a mitt to groom your cat as well as remove the hair it from various surfaces.